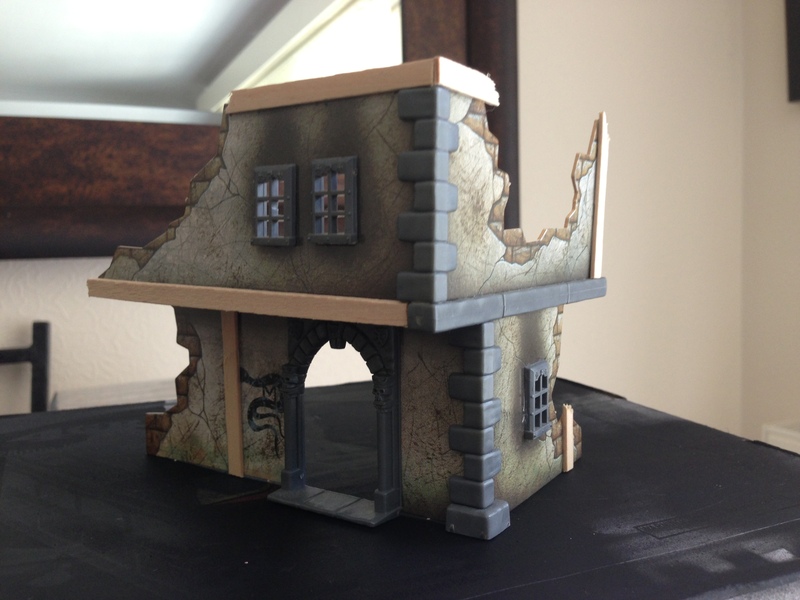 I’m sure the majority of you will be familiar with the card and plastic buildings that came in the old Mordheim box – and the later expansion Blood on the Streets. Personally I really liked them. They did the job they were intended for, were simple enough to put together and they looked decent enough on the board. If you were lucky enough to get hold of more than one set then they started to look really good and your board would more resemble the winding streets the designers of the game intended. In the interest of fairness, they could also be flimsy, restrictive and lacking detail. They would also, with continual use, tear or simply fall apart as the glue would really take on the treated card. However, with some very simple additions at minimal cost they can ascend further up the ladder of scenery greatness and find their way onto more of your gaming boards. The first things you’ll want to get hold of are coffee stirrers. Millions of them. Not that you’ll need millions for what this article is about, but they’re just so damn useful that if you don’t have some already then go to the nearest coffee shop or fast food outlet and get yourself some. Now. For free. By the handful. You’ll also want some hardboard, you know, that stuff the bottom of your sock drawer if made of – or any other suitable material you can lay your hands on. And then your usual assortment of PVA, sand, gravel, bits box scavenges etc. There will be two primary benefits to the treatment we will give the Mordheim Buildings: better structural stability and improved appearance and character. Stage one is very quick and simple; start by cutting the coffee stirrers to the required length and using them to match up the missing beams on all the buildings. The way the buildings are designed means the beams aren’t consistently present so some sides will have them while others will not. Simply glue them straight onto the card and add them to wherever you think they are necessary or where will improve the look of the buildings. With a quick lick of paint or an even quicker wash you’ve already improved both the strength and appearance of your buildings. You could just leave it there or take it to stage two. Stage two merely takes things the obvious step further. It’s a bit more involved and time-consuming but by cutting the coffee stirrers to random lengths and gluing them to the floors to create floorboards you can massively improve the building’s appearance. By twisting and snapping some of the lengths you can get a more realistic splintered effect for where the floors have collapsed or been smashed through by falling comet fragments. The floors are actually one of the most visible elements of the buildings when on the board and I can’t overstate the difference the floorboards will make. Again, a simple dab with a brush a la stage one and stage two is done. Stage three is for the more dedicated hobbyist and involves fully basing your buildings using the aforementioned hardboard. Cut and shape to fit, glue the building down and then add as much or as little detritus as you want – rubble piles and fallen beams both look great and provide obstacles when gaming. A few choice model components, such as a treasure chest or skeleton, add a little story to your buildings and can also be the basis for scenarios or used as objectives. A word of warning though, don’t over do the sizes of your bases as it will only take more effort to fill without any additional benefit – a maximum of an inch or so around the edges plus the space within the buildings perimeter will be more than enough space to fill. Finish off with sand/gravel and then paint it up. It’s up to you if you want to paint only the additions or go the whole hog and spray/paint the entire thing. If you go for the quicker first option just make sure you paint the edges of all the visible card sections of the buildings which shine out in white – it seems minor but again, I can’t overstate the difference it makes. For those of you who go the whole way, you will be rewarded with a set of amazing looking buildings for an absolute minimum additional cost which will suit almost any 28mm fantasy or historical board. And with current prices heading the way they are, that should not be sniffed at. If you want to take things even further, you can also use yet more coffee stirrers to create scratch built walkways, platforms and barricades to really elevate the terrains set into something a bit more special. 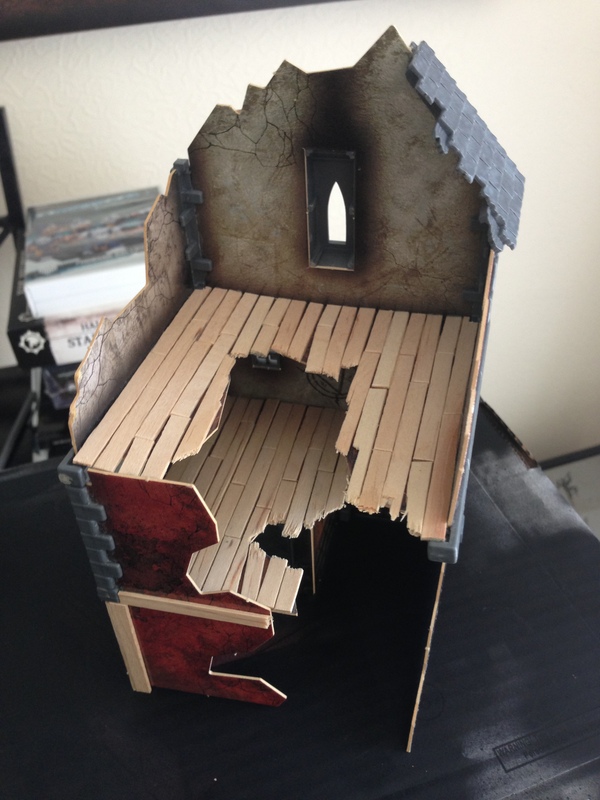 Hopefully your old Mordheim building set should now be one of the first things you take out of your scenery box rather than the bent and broken last resort so many of them have become. Terrific article, Lee. Welcome back to the hobby. I look forward to more of the same!